My German-English dictionary translates Brät as 'sausage meat', and Annemarie Wildeisen agrees, calling it a kind of fresh sausage. Often made from veal (Kalb), it's a mix of the same parts of the animal that would be used to make sausages—muscles, Speck—plus seasoning and ice to keep it cool during processing. And it is seriously processed (the Swiss Kalbsbrät at least), hacked down until it is almost impossibly smooth. (my butcher really does sell a lot of things besides meat). Sometimes our butcher has it fresh, in a big metal bowl, and he uses a plastic scraper to thwop it directly onto the butcher's paper. Sometimes it comes frozen in little tubes and you can thaw it overnight in the fridge (like in the pictures above). But what can I do with Brät? 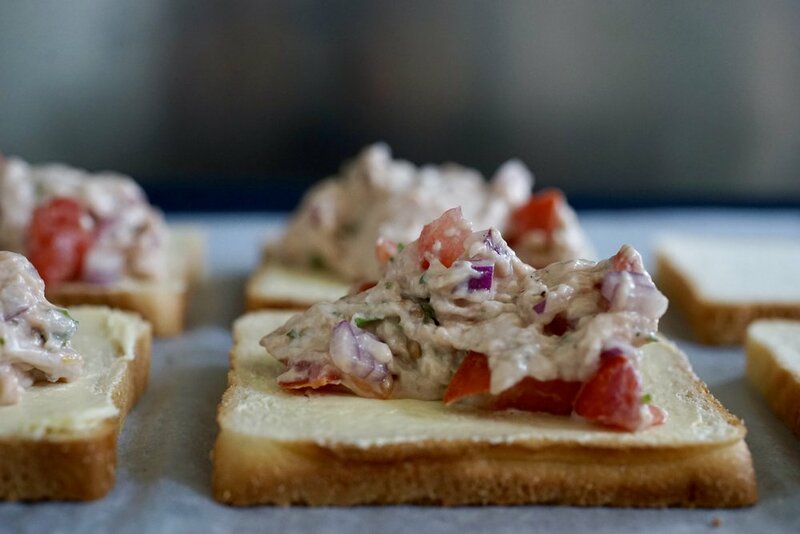 You can make these super retro toasts! Aside from that, Brät has various other applications. You can make Brätkugeli, which are little sausage balls featured in pastetli (I made them for the Lozärner Chügelipastetli here). These can be bought already in ball form, or you can drop bits of raw Brät into boiling water and watch the little balls form. But perhaps the best application is in Fleischkäse, which is kind of like meatloaf and, contrary to what its name suggests, contains no cheese, but is made up almost entirely of Brät. As for the Brätschnitten, they are a quick and easy meal, probably nice with soup or salad—we ate ours on a lazy Sunday afternoon and they were delicious. 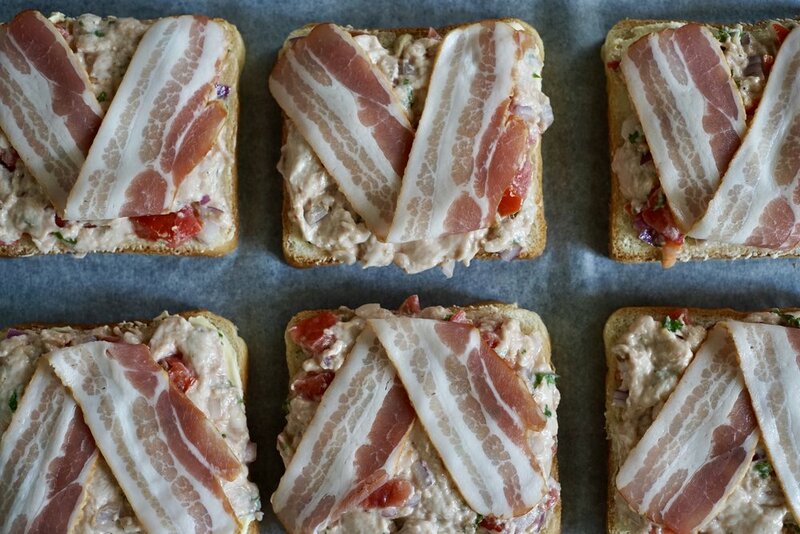 Or you could do them in miniature with some Toast Hawaii and Appenzeller Toast for a retro Apéro. From the 1984 edition of Betty Bossi's 100 Wunder Rezepte: Ghackets, Würscht und Gschnätzlets, pg 56. In a medium bowl, mix together the Brät, onion, tomato, parsley, mustard, lemon juice, and seasoning until you get a homogeneous spread. Place the bread on a parchment lined baking sheet, then spread with the meat mixture. Top each slice with a piece of bacon. Bake for about 20 minutes, or until the bacon is nice and crispy. Annemarie Wildeisen has a great tip: if your Brät comes on butcher's paper and is sticky and hard to get off, run the whole package quickly under warm water and it should scrape off easily. Be sure to really spread the Brät mixture to the edge of the toast bread—you can see from the photos that it has a tendency to shrink back.